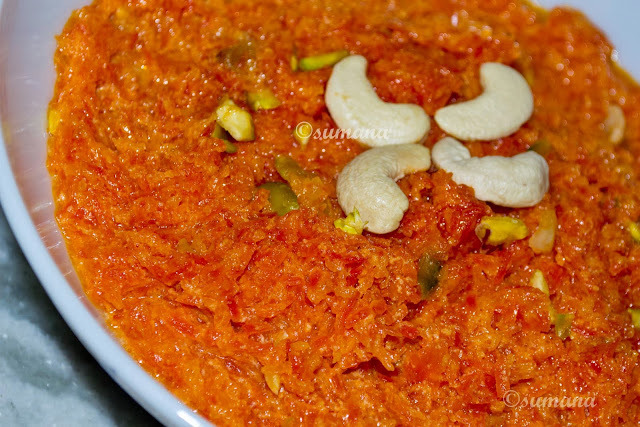 Carrot halwa is an Indian dessert, made with milk, ghee and sugar. In winter any meal is incomplete without this dessert. This is an easy to cook recipe and does not take much time. Ingredients are also mostly available at every kitchen. If khoa is not available, condensed milk can be used. Heat ghee in a pan and add grated carrot. Stir it well and fry lightly. Now add milk and cover it for 10 minutes in low flame. When the carrots are tender add sugar and khoya and mix well. When it becomes little dry but oily, add chopped dry fruits and mix it. Serve it hot or cold as you like.